Five ways you can make Valentine’s Day more special. Of course, you might want to prepare a gourmet meal with sous vide lark’s tongue served with a white truffle foam. But if your kitchen skills don’t stretch to getting you a Michelin star or three, you might perhaps consider a more down-to-earth alternative: PIZZA. I mean, who doesn’t love pizza? How about this one? 1) To make dough, remove one rack from oven and place the other on lowest position. Preheat oven to 200 degrees F. When it reaches temperature, turn it off. This will create a cozy place where your pizza dough can rise. 2) Coat each of the two round pans with olive oil. 3) Heat milk in a microwave in two 30-second intervals, stirring in between. Add sugar to the milk, then add the remaining 2 teaspoons of olive oil and stir. 4) In the stand mixer, add the flour, yeast and salt and mix slowly, using the dough hook. Add the milk mixture and increase speed to med-low and mix for about five minutes. If you don’t have a stand mixer, mix ingredients as above and knead dough by hand until the dough loses its elasticity, about ten minutes. 5) Spray the large bowl with spray and place the dough inside. Cover lightly with plastic wrap. Place the bowl in the preheated oven and allow to rise for about 30 minutes. 6) While the dough is rising, make the sauce. In a medium saucepan, add olive oil, tomatoes, garlic powder, salt and pepper to taste. Heat over medium, stirring occasionally for about ten minutes. Cover and remove from heat. 7) Divide the risen dough into two equal balls. 8) Use a rolling pin, roll the ball into 7” disks. Place each disk into an oiled 9” pan. 9) Using your fingers, gently tug the dough to form a 9” disk. Cover both pans with plastic wrap or a cloth and set aside in a warm place. Let the dough rise for another 20 minutes (not the oven). 10) While the dough is rising in the two pans, put the oven rack back in the center position and heat the oven to 400 degrees F.
11) When the dough has risen, spread 2/3 cup of the sauce onto each pizza, followed by 1½ cups of the cheese. 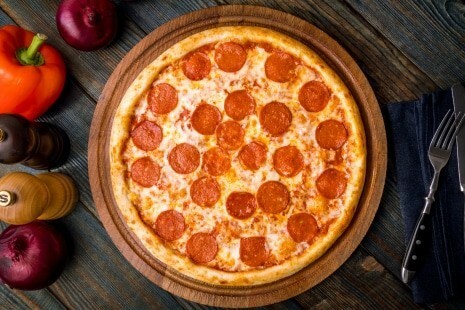 12) Divide the pepperoni into two equal parts and place rounds to form a heart shape in each pizza, starting with an outline and then filling the hearts in as you can with the amount of pepperoni you’re using. 13) Bake the pizzas for about 20 minutes until the cheese is melted and the crusts are golden. Remove the pizzas from the oven and allow them to rest for one minute. Remove each pizza from the pans and serve so the hearts are intact. 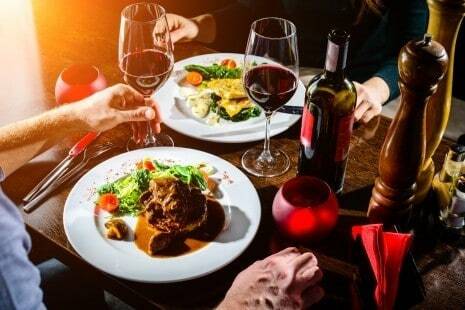 Unless you book early, going out for dinner at a fancy restaurant will probably mean elbowing your way up to the host or hostess and putting up with a horrible wait for a table. If you haven’t left things too late, then www.opentable.com can help you locate a restaurant in your area and show you what time slots might still be available. Heart-shaped pancakes are almost too obvious, aren’t they? 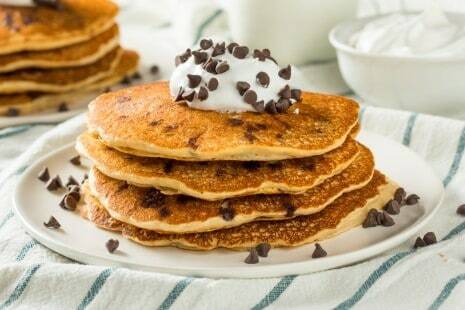 Still a nice treat in the morning, with gobs of butter and drenched in maple syrup, or with chocolate chips and accompanied by some sliced strawberries. What to drink with pancakes in bed? How about Pink Mimosas? The recipe, which is here couldn’t be simpler: ice in a champagne glass, half juice, half champers, insert straw, serve. If your significant other has a sweet tooth — and who doesn’t indulge on Valentine’s Day? — then why not try something a bit different this year? 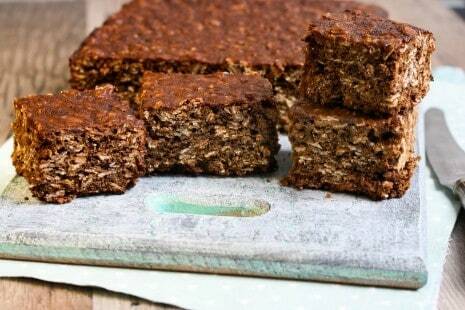 Yorkshire Parkin is a gingery, sticky sheet cake treat that can be enjoyed cold or warmed up and eaten with a scoop of ice cream or a dab of whipped cream. As a Valentine’s Day treat, you might serve it warm, with a scoop of ice cream and a few pink sprinkles. 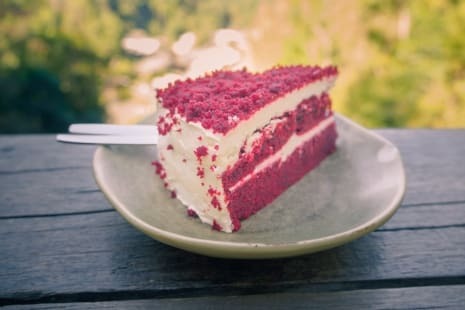 If you have the time and energy to make a cake, why not try a Valentine’s Day version of that prince of cakes, the Red Velvet Cake? Of course, you can probably find a mix at your local bodega, but wouldn’t it be fun to make one from scratch? 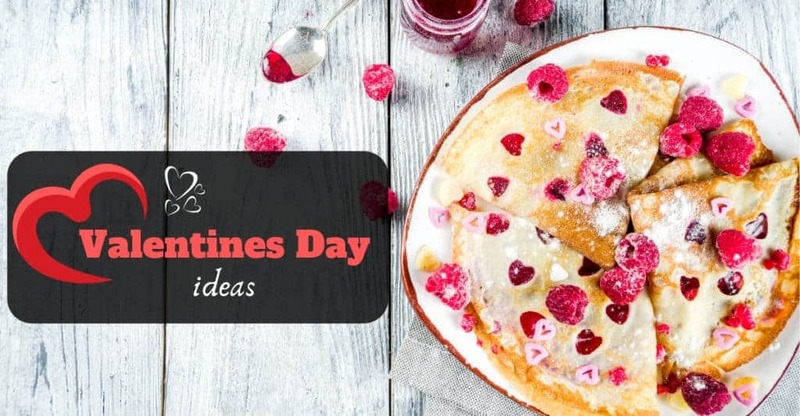 What about trying a Pink Velvet Cake, by adapting a Red Velvet Cake and turning it into something more appropriate for Cupid’s day? There’s a good recipe for Red Velvet Cake here. But if you’re feeling like experimenting, you could just skip the cocoa powder altogether and substitute the red food coloring with this. You’ll end up with a PINK VELVET CAKE that will amaze everyone. Take it over the top with a few pink sprinkles on top, or why not create a pink or red heart on top of the cake? If you don’t have a heart-shaped cookie cutter, then you can cut out a heart in the middle of a sheet of paper, carefully place it on top of the icing, and add the sprinkles to form the heart shape before removing the paper. What’s left should be a sprinkles heart. Many couples today are so caught up in the day-to-day hustle that it can be hard to make room for baking or fixing special meals at home. Between work, commuting, kids, school, church, sports, shopping, the gym or the many other things we fill up our lives with, there’s often one thing that’s the most important commodity of all: time. So why not mark this Valentine’s Day by giving your significant other the gift of time? Let’s turn off our phones, sit down together at home, or at a restaurant, a coffee shop, or on a bench in the park. Your choice. Let’s hold hands, talk about our life together, perhaps think about the past we’ve shared, or dream a little about the future. Let’s carve out one hour dedicated exclusively to the love we share. No distractions. Q: Who invented Valentine’s Day? A: Nobody really knows the origins of Valentine’s Day. Some condemn the celebration, pointing to the early Roman feast of Lupercalia, where pagan rituals linked to fertility rites were performed. For this reason, some churches today consider the modern Valentine’s Day celebration to be wicked. In Simple Simon’s view, it’s not important to poke about in these pagan origins. Valentine’s Day today is a celebration of love, and who but Jesus taught us that this was the greatest of all things? Let’s forget the animal sacrifices of 2,000-plus years ago and focus on the cake, the candy and the love. Q: Where did the modern Valentine’s Day come from? A: It’s been around for a while. From about the 17th century, friends and lovers would exchange small tokens of affection. In the U.S., a certain Esther A. Howland, known as the Mother of Thanksgiving, began selling ready-made cards as early as the 1840s. By the early 20th century, printed cards were everywhere, and gradually, we learned that ribbons, boxes of candy, chocolate-dipped strawberries, heart-shaped edibles of all kinds, and bunches of flowers were the best vehicles to mark our affection. Q: How many people send Valentine’s Day cards? A: An estimated one billion cards are sent every year, most of them (about 85 percent) by women.